On the night of September 3, the full moon will rise slowly in the east as the sun sets in the west. Talk tomost astronomers, and you?ll find that they have a thing about the full moon.The reason is that a full moon is the No. 1 cause of natural light pollution.Its brilliant light floods the night sky, dimming all the stars and nebulae,causing astronomers to pack away their telescopes and watch television instead. However,to dedicated skywatchers like us, the moon has its own fascination, especiallywhen it is full, as it will be Friday, Sept. 4. After all, this is the onlyobject in the solar system on which we can see a wealthof detail without any optical aid whatsoever. Thefull moon is particularly appealing at this time of year when it rises justaround sunset and hovers low in the southern sky most of the night. Thefirst thing to lookfor is the man in the moon, or perhaps you can more easily see the woman in themoon or even the rabbit in the moon. One way or another, you can probably see apattern of some sort in the play of bright and dark markings across the moon?sface. The darker areas are known as maria (singular mare, Latinfor sea), though they have never seen a drop of water in the last four billionyears. The lighter areas are mostly cratered highlands, where relatively recentasteroids have crashed into the moon?s surface, exposing bright rock beneaththe surface. Thelargest dark area on the moon, on the left side, is actually called an ?ocean? :the Oceanus Procellarum or Ocean of Storms. Just above it, and almost aslarge, is the Mare Imbrium or Sea of Showers. Opposite Imbrium onthe right side of the moon is a triangle of three smaller ?seas? 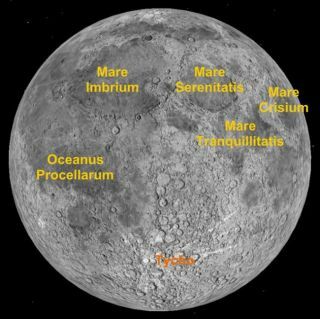 : the MareSerenitatis (Sea of Serenity), Mare Tranquillitatis (Sea ofTranquility) and Mare Crisium (Sea of Crises). Althoughthere are smaller seas, most of the rest of the moon?s near side is highlands,covered with hundreds of craters. By far the most prominent of these is Tycho,named for Tycho Brahe, the greatest astronomer of the sixteenth century. Thiscrater is brilliantly white, and is the source of a huge system of rays: brightlinear features which encircle the globe of the moon. The Tycho ray system,along with several smaller ray systems, are best seen when the moon is full. Thereis a whole set of traditionalnames for the various full moons throughout the year. The most famous ofthese ?named? full moons is the harvest moon. Seeing the beautiful big moonrising in the east this week, many people will think it is the harvest moon,but it isn?t. Although the harvest moon usually falls in September, this yearis different. Harvest moon is defined as the full moon closest to the fallequinox. Thisyear the fall equinox occurs on Sept. 22, and the nearest full moon to thatdate is on October 4. So this full moon on Sept. 4 is properly known as the?fruit moon? or ?full fruit moon? since it signifies the ripening of fruit.